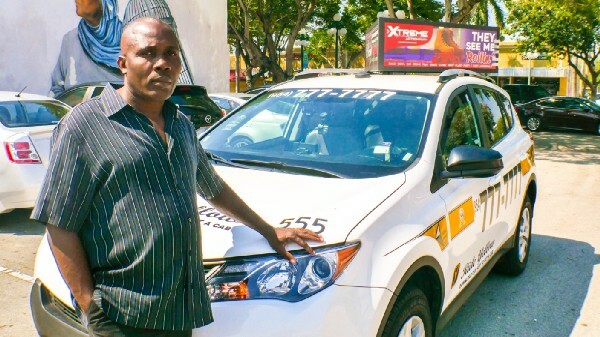 Louinot Garbiel was chosen as Driver of the Month due to his Honorable track record of personally seeing passengers items left In the taxi are returned . His last creditable act was when he picked up a excited cruise passenger of the Independence of the Seas. They had pleasant conversation and once at the port she took her bags in the trunk and was on her way to her voyage. Mr. Gabriel was on his way to pick up another passenger and noticed a big purse in the back seat. After dropping off the passenger he went straight to the port and Called the our 24/7 Customer Service Care line to inform them in case anyone called so they could be notified. Once at the port he stopped the sheriff and activated the camera when he handed it over ..the sheriff took it and headed to the ship dock where they called the passenger to retrieve her purse . Father of 8 children 7 girls and I spoiled 12 year old boy …he has provided for his family from hard work and been able to put 7 in college at Boston University.